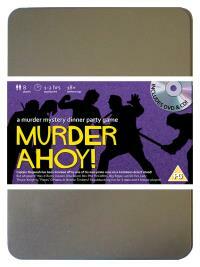 You've been invited to play the role of LADY THRYCE-KNIGHTLY in Murder Ahoy. You are invited to a swashbuckling murder mystery set in the tropical waters of the Caribbean! Captain Mugwash and his pirate crew are shipwrecked on a desert island where they find a buried treasure chest. But during a drunken celebration on the beach the Captain is discovered slumped over the chest, murdered! Please join us to find out who buried the ol’ Sea Monkey! The Stowaway (she’s quite feisty for someone so lady-likely!) Costume suggestion : Your lady-like elegance is all that‟s left after being a stowaway for so long. Your flowing purple skirt has been torn short and your lacey blouse is ripped in the most revealing places. Still, you don‟t need to look regal to be regal, but you do still wear a large gold locket around your neck that holds a family portrait. I’m the daughter of a rich Lord and I stowed away on the Dirty Monkey to escape the stuffy confines of my English aristocratic life. When the Captain found me, he agreed to let me stay on board as long as I entertained the pirates every night with my singing and dancing. Well, it’s a small price to pay for my freedom!